Have you noticed how frequently Adobe update their reader?? it seems almost daily at the moment. I am SO SICK of having to use up MY TIME to HELP Adobe to FIX THEIR PROBLEMS. It would not be so bad if their lousy update program did not insist on a reboot – like we all have time on a regular basis to close down what we’re doing. Come Adobe – your program isn’t rocket science.. GET YOUR ACT TOGETHER. I’ve been thinking about this for some time as I really can’t handle Orange’s restrictive practices on using WIFI. For many years I owned various Microsoft Smartphones, paying maybe £30 a month to Orange – and with the ability to share the 3G connection with my laptop – then along came the iPhone – and all of a sudden despite paying slightly MORE monthly, this becomes a CHARGEABLE item! That’s just not right. Anyway, the iPhone 3GS is now 18 month old, got a few months left before considering when to upgrade and what to upgrade to.. and so I thought I’d give it a go. Redsn0w ( http://blog.iphone-dev.org/ ) will jailbreak all but the iPad2 and so I downloaded the program to my Windows 7 PC after much reading on the subject. Well, of course it didn’t’ work – turns out you need to use it in XP SP3 compatible mode- a simply right-click option. Minutes later, one jailbroken iPhone – it really is that simple – note the new icon in the photo on the right – except – that Cydia, the repository for jailbroken apps – is currently having issues with Amazon who provide their storage… basically for now it’s bust. so now I have to wait patiently, not something I do well, for them to get their act together so I can go and grab the relevant software to make my phone, once more into a handy source of signal for the iPad and laptop when on the road. Of course, I have a MIFI unit which provides WIFI access – but that’s on THREE – and there are believe it or not times when Orange’s signal is the stronger.. so hopefully soon I’ll have the best of both worlds. 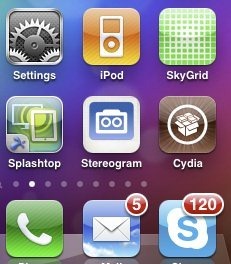 More when Cydia is NOT bust. 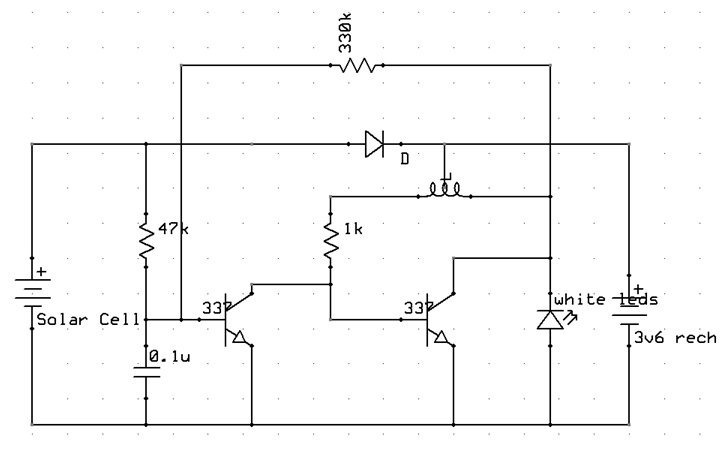 It’s not very often I bring you a circuit – but this is quite fun to play with and simple. I don’t claim to have come up with the original design – but then the original was only 3 components…. Here we see a circuit that a first glance should do very little. the circuit is a little misleading in that actually we’re looking at 2 or 3 white LEDS in series such that the turn-on voltage is higher than the battery voltage. Imagine (in conventional terms which of course is wrong) juice coming out of the + of the battery, through half of the coil, through the LED – except no – the battery is not high enough voltage so essentially nothing happening there and in any case, the second (rightmost) transistor is turned on so you’d still not get any LED lighting up – you’d just drain the battery and probably blow the transistor. Ok, but that doesn’t happen because the FIRST transistor is holding the second one OFF due to light from the solar cell generating a voltage into the base of the first transistor. Of course that’s all wrong – in fact, the coil, 1k resistor and second transistor form a reliable oscillator when not held off – I might be wrong but I seem to recall it’s called a Colpitts oscillator! So during the day, the solar cell is charging the battery, the 47k resistor is turning on transistor one which is holding off transistor two. Result, very little current flowing – battery gets charged. Comes night-time, the solar cell generates nothing, the first transistor turns off – the second transistor starts oscillating like mad. Because there is a coil involved, there is a back voltage caused by the oscillation – which generates pulses of MORE than the battery voltage- and the LEDS light up brightly. 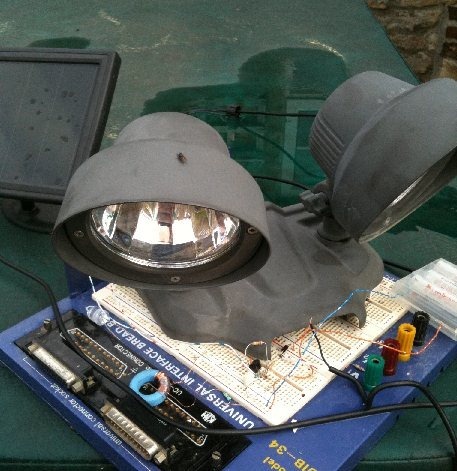 Where this circuit would normally not do too well – and variations of this are common on cheap Chinese solar garden lamps- is that at twilight the LEDS would partly come on – and they end up flashing and all sorts. the 330k resistor provides positive feedback to arrange a snapping action – ensuring the LED does not come on until it’s REALLY dark, then stays on until it’s reasonably light – no dim lighting or half-way house – the only issue being – the current coming back from transistor 2 comprises pulses – which we don’t want – hence the solitary capacitor on the circuit! Try it – works a treat. The coil, well, I had one of those ferrite rings, maybe an inch diameter, you can see it in the photo below – it’s blue. I simply wrapped thin wire 20 times, brought out the centre-tap – another 20 times… that’s it. Solar cell is around 5” square and generates 6 volts off load – a bigger one would be nicer.. the battery is merely 3 1.2v AA 2500MAH NIHI batteries in series and for LEDS I used some 10mm whites – in total I had 6 of them (2 sets of 3 in series) – lights up part of the garden a TREAT for several hours. I was planning on trying again to night but guess what – it rained overnight! The new iPad2 just keeps going from strength to strength! For new readers, no I’m not an Apple Fanboy, I’ve been a Windows man since, well, DOS! But then there is the concept of “the right tool for the job” – Windows has it’s place – and so does the iPad2. Tonight I was sitting here getting on with some work on my Windows 7 PC (if anyone is still using XP or Vista, do yourself a favour if it’s not cost-prohibitive – bin them – Windows 7 is light years ahead) and my wife (who is currently in the USA while I’m here in sunny downtown Wark in Northumberland) rang me on Facetime (which for those of you not in the know is Apple’s kind-of equivalent of Skype). I picked up the iPad2 and pressed the connect button and there she was – in a Barnes and Noble somewhere in Chicago – for all the world you’d think she was next door and we had a nice chat as I went off looking for the new kitten (she’s been away for a week and kittens grow quickly). After waving to our pal Debby I asked her to switch cameras to the back camera – at which point I got a good look around the shop before ending the (free) call. I recall before we got married you were talking a dollar a minute thanks to greedy BT (well, their predecessor) and their US equivalent.. thankfully – those times are gone forever and BTs claim to owning the Internet went no-where – what a joke. Maureen and I chatted for a while as I got a good look around the store.. and then we ended the call and I noted a new update for Splashtop – which is a program that sits on your PC or PCs at home which then lets them talk to your iPad (for the techies, much like LOGMEIN but about a century ahead of the latter). I popped into the house and upgraded Maureen’s PC. Some time and a glass of wine later I figured I’d give it a whirl. For the uninitiated, Splashtop and Logmein are programs that let you access the screen and keyboard of one PC from another – in the case of the latter – you can access your PCs from your iPad or iPad2. Well, I don’t know if it was the upgrade or the extra speed of the iPad2 but I’m here to say that sitting in my office, I accessed Maureen’s Windows 7 PC from the iPad2 and went off to the BBC website – selected the latest news video (Flash – which the iPad doesn’t support natively for good reason) and ran the video. You would NOT believe for a SECOND that you were watching this remotely – PERFECT video, PERFECT audio, PERFECT sync – the power of a desktop PC in my hand! The future of computing… remote access to any PC you own – and video access to those you know… on a lightweight, all-day-battery tablet – is here! It actually blows away the original Star-Trek concept which was limited to boring technical data only – but then that was a generation ago. What we need now – is better, more universally available WIFI (FAR more important than 3G and it’s successors IMHO) studio lighting on the tablets so you look good in a pub when video conferencing – and that’s simple –strips down both sides of the tablet that light up white (high efficiency but WARM LED lighting – now readily available)… UTTERLY practical due to the low power requirements of warm white LEDs. and hey – this was MY IDEA!!!! Don’t let anyone tell you otherwise. Technology that works – warm sunny weather in APRIL… what MORE could you want? It’s upgrade time again, though this time nothing major. Apple have put out a fix (ios 4.3.2) which solves an issue with Facetime (their video conferencing software which unlike Skype is designed for the larger screen – it is about time Skype got their finger out). The release also fixes some 3G issues but even at this late date does not seem to address the tablet’s utter inability to pick out the best WIFI signal from a range of available access points. Anyway, the update takes (on my 5 meg connection) around 10-12 minutes to download and just a few minutes to do the upgrade with no user work involved – just sit back and watch. The upgrade runs smoothly just as the last one did.